An East Ridge police cruiser is parked at a gas station nearby after an East Ridge police chase on May 26, 2016. When: Saturday, from 11 a.m. to 5 p.m. Cost: The cost is $8 per plate, $5 for a sandwich and chips, and bake sale and raffle tickets are $1. Other Information: Tickets can be purchased prior to Saturday at Broomes Wrecker Service, at 4003 Ringgold Rd., or The Market Link Gift Shop at 4103 Ringgold Rdoad. 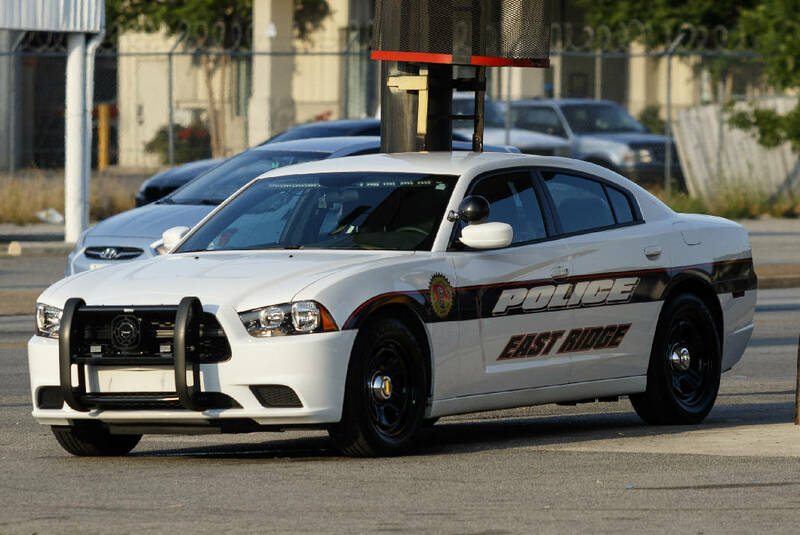 EAST RIDGE — If you ask the union, the police department here has been a mismanaged ship for the last four years. Officers didn't have access to rubber gloves. Didn't have enough stun gun cartridges to fire as part of their yearly certification process. Didn't have enough patrol cars to all ride separately. And didn't have a chief willing to listen to requests or advocate for them. Just last month, said Vince Champion, the southeast regional director of the International Brotherhood of Police Officers, one East Ridge officer was suspended from the SWAT team for bringing up concerns about outdated safety vests. Chief J.R. Reed said he couldn't comment because the officer since has filed a grievance with the city. "That sums up the whole case of this police department," Champion said. "'Don't tell anybody that we don't have what we need to do our job.' You add it all up, and that's why they finally reached out and wanted us to come in." If you ask police Chief Reed, a former patrolman for close to three decades who's been in office since 2014, officers haven't brought specific concerns to him. Plus, he said, the department's at maximum personnel for the first time in a number of years, adjusting to an overtime policy that benefits officers, and recently set aside money for seven new cars and more stun gun cartridges. But the union, which formed in March and includes 35 of the department's roughly 45 officers, said that doesn't solve the underlying problems that caused officers to lack basic equipment in the first place. In an effort to help the officers, local residents are hosting a "Back the Blue" fundraiser at 11 a.m. Saturday at Camp Jordan. "East Ridge is the second-largest city in Hamilton County with nearly 22,000 residents," event organizer Jody Grant said last week. "And it speaks poorly of our government that the people who respond to 911 calls do not have the basics. It has to change." When they need things, East Ridge officers are supposed to put in requests with their supervisors, typically a sergeant or lieutenant, who then speaks to Reed or Assistant Chief Stan Allen. That process is referred to as "the chain of command." But since 2014, the chain of command has allowed leadership to make decisions with minimal officer input, or to threaten officers who go around it, said Champion, who spoke on behalf of several members fearing retaliation. In that same time, Reed has helped secure new handguns, stun guns and in-car radios, body cameras and a better overtime policy for officers. It's also difficult for the department to predict how much money it's going to need for things such as overtime or the officer's tuition reimbursement program, said City Manager Scott Miller, who pointed out East Ridge overspent on both items last year by about $40,000. "I know in the past two years we've done an awful lot," Miller said. "It hasn't just been me: The chief asks for some of this, and I agree with him. He's been pushing for body cameras and going with all new service weapons." But Reed rejects simple requests for equipment, the union says, claiming the department needs to save money as he pushes for items he wants. For example, Champion said, Reed pushed for e-citation ticketing books in 2017 from the City Council, but wouldn't take a SWAT officer seriously when he said his squad's safety vests need replacing. Then budget issues in April caused Reed to postpone in-service training for three out of the four squads, meaning most officers haven't yet received their yearly certification, Champion said. When officers feel the chain of command isn't working, they've sought help from other officials. Patricia Cassidy, the East Ridge City Court clerk, said she asked Miller to take about $5,000 to $8,000 out of her budget in 2017 to get new uniforms when she learned two new officers were wearing duct-taped boots and long-sleeve shirts in the summer because their requests had been denied. She did it this year, too. "I asked them to put a new, $20,000 prisoner transport van on my budget," Cassidy said. "And I'm giving it to them, because they need it. They've got a van over there with no A/C and it breaks down. It's not only for the safety of the police officers, but the prisoners, too." But getting outside help has created more calls to adhere to the chain of command. "Please remember that any questions for personnel at city hall must come through the chain of command unless otherwise authorized by the chief of police," Allen wrote in an email to all officers on Aug. 31, 2017. Then there's the issue of rubber gloves. In October 2017, when officers learned a batch of drugs sent to the Tennessee Bureau of Investigation tested positive for the synthetic opioid fentanyl, a few requested boxes of rubber gloves, Champion said. But they couldn't get more than a few pair at a time. One supervisor approached Allen but was told Reed couldn't trust officers with whole boxes, Champion said. Officers are encouraged to wear rubber gloves "when handling blood, bodies, and other biological materials," according to the TBI's crime scene safety procedures. Asked for comment, Reed said nobody ever approached him about the gloves. Another breaking point for many unionizing officers was Frawley Lake, Champion said. On Feb. 15, Reed sent an email to supervisors instructing them to have their officers use a special criminal database on any vehicles that improperly park overnight in the private, gated community. "If the vehicle tag information comes back to a resident living in the community, email the vehicle information and address to me and I will forward this to the HOA [homeowners association] so they can be given formal notice to them," Reed wrote in the email. Some officers, however, believed that order would violate an agreement with the TBI that allowed the department to use the criminal database in the first place, Champion said. They never scanned the tags and, a few weeks later, the chief dropped it altogether. "There is not a list per se of what they cannot do, but the purposes do need to be for law enforcement purposes," TBI spokeswoman Susan Niland wrote in an email about appropriate uses of the database, known as the National Crime Information Center. Reed said he asked officers to run the tags because it was a "parking issue, and then it turned into some possible property crimes." Champion said that's the first unionized officers heard of possible property crimes at Frawley Lake. Grant said she other and residents learned about police equipment issues when the union's national representatives came to an April 26 council meeting. "We've donated 3,000 pairs of these gloves," union representative Ken Allen announced that night, "because the men and women up here were having difficulty getting a simple piece of equipment to protect themselves." Grant said unionized officers have identified other concerns to her: Patrol officers who don't have rifles, raincoats or practice ammunition, as well as limited funds for reserve officers, who have to purchase their own boots and other items that aren't available. After they unionized, Champion said, officers learned an interesting fact: There had been spare boxes of gloves locked up in the department the whole time. The officers just didn't have access.